How Much Do I Owe for Income Tax in Monopoly? How Do I Calculate Income Tax in Monopoly? 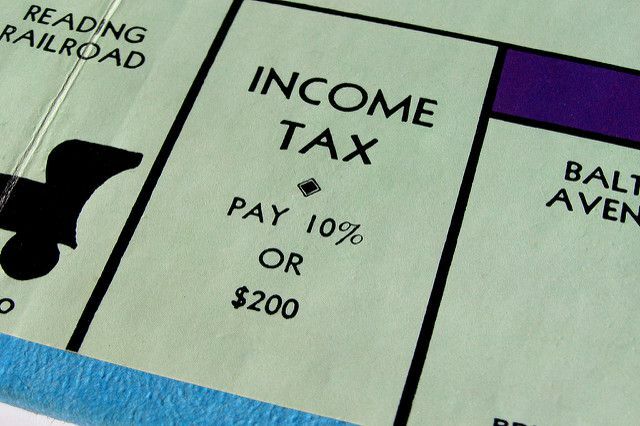 One of the least-liked spaces in the board game Monopoly is the Income Tax space. A player who lands on Income Tax must choose one of two options: pay $200 to the bank or pay 10 percent of all his assets. According to the Monopoly rules, you must make your choice before adding up your assets, so it makes sense to always have a general idea of their value. If you think you have assets worth more than $2,000, you should go ahead and pay the $200. If you suspect your assets are worth less than $2,000, you should do the math and pay 10 percent. Since the Income Tax space is located just four spaces past Go, players can pass Go, collect $200 and then land on Income Tax. In this case, the $200 just received from passing Go must be counted as part of the player's assets. After you add up the value of your assets, pay 10% to the bank. For example, if your assets add up to $2900, pay $290 to the bank. You can't go back at this point and elect to pay the $200 option you had before you added up your assets. Different editions of Monopoly have had different income tax rates over the years. The original 1935 edition charged $300 income tax. In the Mac edition published in 2000, the tax percentages were 0%, 5%, 10%, 15% and 20% and the accompanying dollar amounts were $0, $100, $200, $300 and $400. In the 2007 edition, the income tax amount was a whopping $900 or 10% of your total worth. Income tax is paid to the center of the board (not the bank) where it can be claimed by the next player who lands on Free Parking. What Happens on the Free Parking Space in Monopoly? Is Your Old Monopoly Game Worth a Lot of Money? How Can I Make Monopoly More Fun to Play? Can You Make Side Deals in Monopoly? What Are the Most Popular Monopoly Pieces? Do I Have to Build Evenly in Monopoly?